Well, we are in our new house and LOVING every minute of it. Sorry I have been absent from the blogging world...I have just been TOO tired to think...let alone blog. I'll give you a recap of all that has gone on. Friday, August 1st - Closed on the house. Monday, August 4th - Moved out of apartment and spent first night in home. Tuesday, August 5th - Alarm system installed and activated, TV mounted on wall, Frank (my step-dad) came and fixed our couch and my desk. Wednesday, August 6th - Locks re-keyed, Terminix and wood privacy fence started. Monday, August 11th - DirecTV Satellite installed. Movers vent...first they were three hours late showing up. I had reserved a three man team, along with their biggest truck. A two man team and their smallest truck showed up. In the two and a half hours it took for them to load up the apartment stuff, they took three smoke breaks and helped themselves to the cokes in our refrigerator. Finally, the large truck showed up, along with two more men to go load up the storage building. Oh yeah, they also showed up with NO blankets, no rope and no tools to take things apart! Then, they proceeded to just throw everything in the trucks. So, needless to say, we had several things broken, chunks taken out of furniture and my desk was broken in three places. Yeah, wasn't real happy with the "professional" movers we hired. Funny thing is, this was the same moving company we used to move us into the apartment. And we loved them, they did great then...nothing even scratched! So, if you're planning a move in the near future...I can tell you who NOT to call! The Thursday after we moved, we took the day off from unpacking and spent the day with the girls. They had been real troopers during this move and we rewarded them with a trip to Build A Bear Workshop. Rachel desperately wanted the new High School Musical bear and Rebekah wanted a purple bear. So, that is what they got. We have most all of the boxes with our stuff from the apartment unpacked and put away. There are a few things in our dining room that need to find a home. Our garage is another story. It contains all of our stuff that was in storage and Betty's things from her apartment. It will take a while to get through all of those boxes. But I did get out there and get all the boxes pushed to the perimeter of the garage and we are able to park two cars in there!! New house scare...we had been seeing ants around the house. Monday night we saw a bunch by the back door. So, Tuesday I called Terminix to have them come out and treat for everything. Well, Wednesday morning, Rachel and Rebekah come running into our room telling us that ants were all in Rebekah's bed. 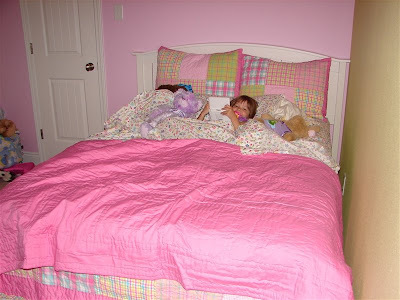 (At the time, she was still sleeping on the trundle bed in Rachel's room). Well, there were several in the bed and a ton in their bathroom. When Terminix got here, the man told us that they were fire ants!!! Oh my!!! Thankfully we haven't seen any more in the house. And last...we were finally able to go and get the mattresses for Rebekah's new bed. My parents went with us to get them with their truck on Sunday afternoon. 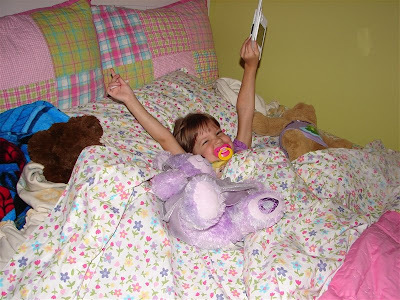 Rebekah was so excited and once it was all put together, she stayed in it the rest of the night...just playing! But, when it came time to go to sleep, she was a little scared, but she did it! She's been sleeping in her room ever since! Remember, she went from the crib to sharing a room with Rachel. I'm so proud of her and I love her new BIG big girl bed. (Yes, we still have a paci. But she only gets it at bedtime. How wonderful that you're getting settled in your new home!!! I've been thinking about you and knew you'd update us as soon as you could! As for the paci.....I saw that picture and thought, "my kids were about that age and still had theirs!" Also only at night or after an injury or something traumatic.